It seems everyone in my family is getting married lately, which means I get to throw lots of parties! Over the weekend I hosted a Bridal Shower for my cousin Amanda. Her wedding colors are black, white and green, so I thought I would make that the theme of the shower. Since I already have black and white wallpaper, I was two thirds of the way there without buying anything. 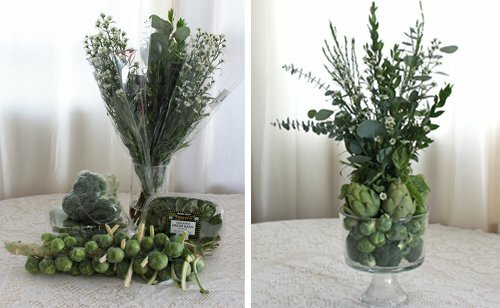 I found myself inspired by the shades of green in some of my favorite vegetables: brussel sprouts, broccoli, artichokes and basil, so I made arrangements out of them. Last night I roasted the brussel sprouts, and I plan to cook up the rest of the vegetables throughout the week. I think I was able to waste a lot less with these edible arrangements. Drinks were easy, I just bought everything with green labels: Sparkling cider, Limeade and Lambrusco. Sliced some limes, added a vintage ice bucket, black and white vintage tray and a pitcher of water. All my aunts brought a dish and I provided the fixings for sandwiches. To make it interesting I put the spreads in recycled glass jars with handwritten labels to make it seem like they were homemade...haha. I did make the pesto mayo, but that is pretty easy. I used my trusty bulletin board for a little creative activity. Using the program Poladroid, I transformed some photos of the happy couple to look like polaroids. 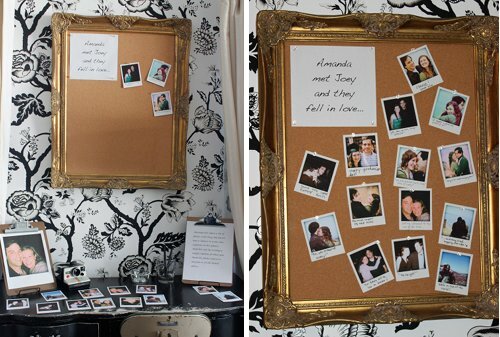 I had a little sign that told guests to help Amanda finish her photo album by writing captions on the pictures. I had to get creative with favors once again. Considering that it is the holiday season, I put together a gift wrap station. Each guest got a bag to fill with pre-cut rolls of vintage wallpaper, old photos and tags made from vintage book pages. 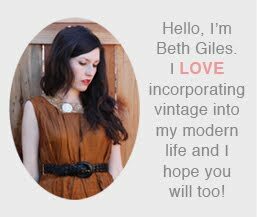 In the front I had spools of vintage ribbon and string and allowed guests to cut them to their desired lengths. It was a great day! I hope everyone enjoyed themselves! your gift wrapping station is so delightful! what a delicious idea - sweet like candy without the guilt of eating the colorful toppings.